Perfect your complexion with the Illamasqua Define and Shimmer Kit; a must-have trio for creating professional makeup looks. A shimmering champagne hue that instantly warms skin. The silky powder glides effortlessly over skin, and can be used for an all-over illuminated finish or applied with more precision to perform like a highlighter. Apply dry for a sheer, natural shimmer or apply the powder with a wet brush for a more dramatic, metallic finish, with long-lasting effect. 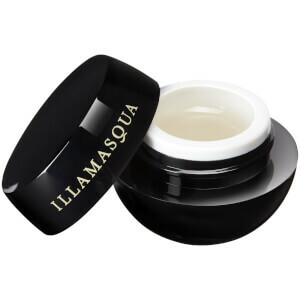 A sheer contouring gel that helps create subtle, natural-looking definition on the contours of your face. Perfect for defining your cheekbones, jawline and forehead, the gel formula creates delicate shadows on the face; apply to facial contours where shadows would naturally be cast. Easy to blend, the formula will leave your face looking naturally chiselled and sculpted. With a lightweight gel formula, the unique primer blends on effortlessly to deliver a luminous, natural-looking glow, whilst maintaining moisture levels to prevent dryness. Improves makeup longevity and leaves skin looking bright and youthful throughout the day. Powder: Apply with a highlighter brush to the tops of the cheekbones to add instant shimmer and shine. Buff onto the collarbone and shoulders to give an elegant golden glow to the skin. Dampen an eyeshadow brush to create a high shine metallic eyeshadow with a long-lasting finish. Gel Sculpt: Using your fingers or a highlighter brush, apply across the temples, hollows of the cheek and jawline and blend gently. Primer: Prior to foundation application, use the spoon provided to apply one scoop to the palm of your hand. Using a foundation or highlighter brush, gently brush the product from your hand and apply all over the face until fully absorbed. Powder: Synthetic Fluorphlogophite, Dimethicone, Hectorite, Mica Ethylene/ Acrylic Acid Copolymer, Octyldodecyl Stearoyl Stearate, Benzyl Alcohol, Sodium Silicoaluminate, Sorbic Acid, Dehydroacetic Acid, Aqua/Water. Gel Sculpt: Aqua (Water, Eau), Bis-PEG-18 Methyl Ether Dimethyl Silane, Propylene Glycol, Sodium Stearate, PEG-150, Glycerin, Phenoxyethanol, Palmitic Acid, Stearic Acid, PPG-26-Buteth-26, Parfum (Fragrance), PEG-40 Hydrogenated Castor Oil, Ethylhexylglycerin, Dimethicone, Hexyl Cinnamal, Linalool, Benzyl Alcohol, Amyl Cinnamal, Benzyl Salicylate, Hydroxycitronellal, Limonene, Yellow 5 (CI 19140), Red 33 (CI 17200), Blue 1 (CI 42090). Primer: Aqua (Water, Eau), Alcohol Denat., Butylene Glycol, Aluminum Starch Octenylsuccinate, Polyacrylamide, Phenoxyethanol, Ethylhexylglycerin, Polysorbate 60, C13-14 Isoparaffin, Methylparaben, Carbomer, Sodium Hydroxide, Laureth-7, Parfum (Fragrance), Sodium Hyaluronate, Glycerin, Sodium Citrate, Xanthan Gum, Titanium Dioxide (CI 77891), Iron Oxides (CI 77491, CI 77492).